Justene Williams, _The Joy of Life After Matisse/Madonna/Marcel_, 2014. Courtesy the artist and Sarah Cottier Gallery. Justene Williams, _Yves Klein Eyes_, 2014. Courtesy the artist and Sarah Cottier Gallery. 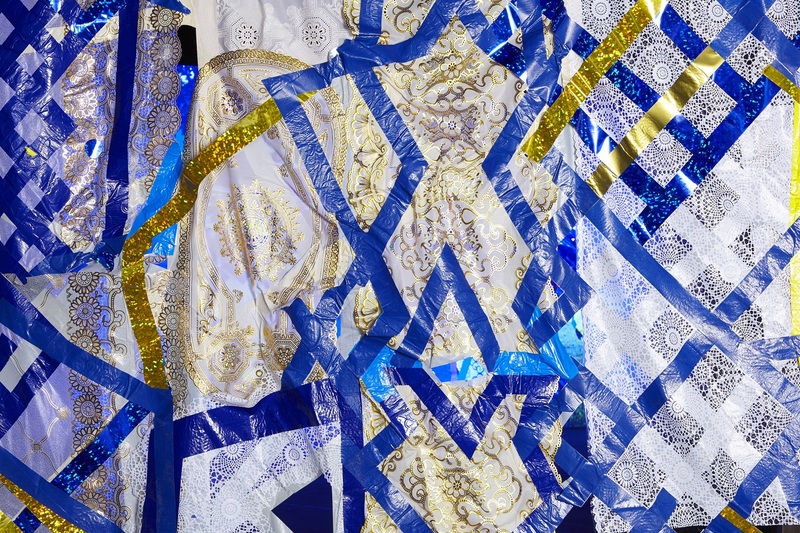 Justene Williams, _Costume relic painting_, 2014, plastic tablecloths, various tapes. Courtesy the artist and Sarah Cottier Gallery. Justene Williams, _Assisted performance sculpture_, 2014, paint, wood, tape, plastic, cardboard, various materials. Courtesy the artist and Sarah Cottier Gallery. 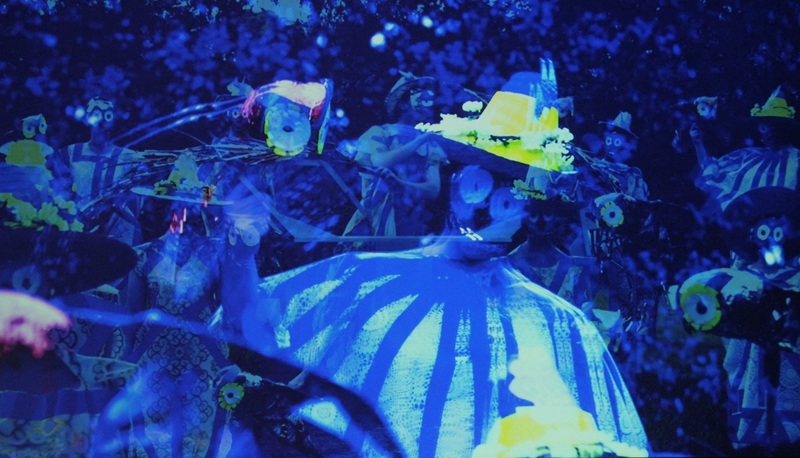 The Curtain Breathed Deeply presents an immersive collection of video and sculptural work by artist Justene Williams. 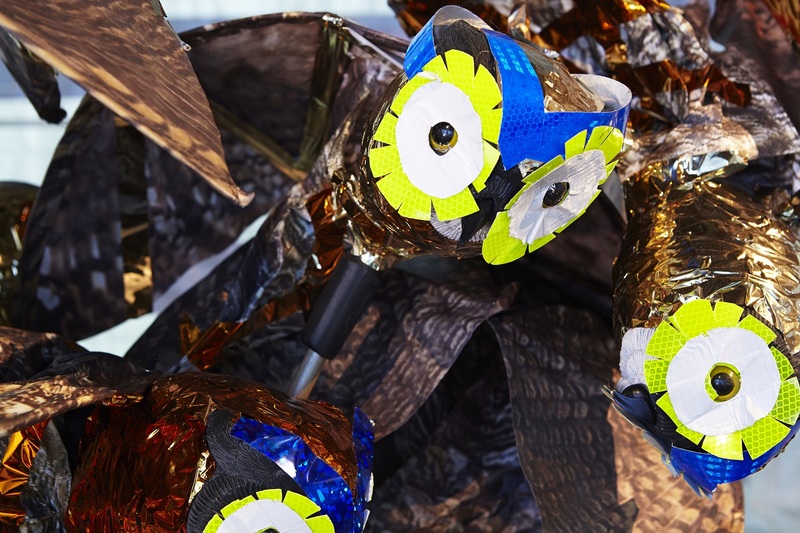 Her largest and most ambitious undertaking to date, Williams uses found objects and waste materials to create dazzling theatrical environments, seducing visitors through a variety of hypnotizing sets and ‘performative’ video installations. 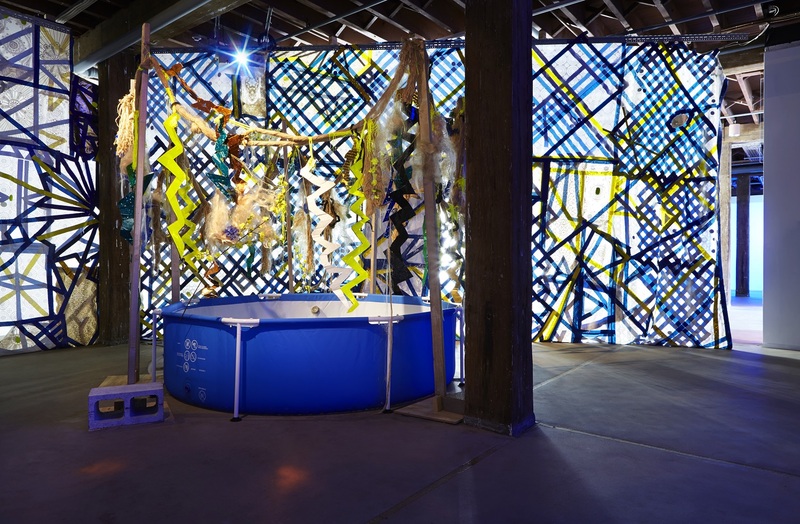 Williams takes inspiration from many sources including memories of her father’s wrecking yard, her childhood training in dance and her experiences constructing elaborate retail window displays as well as early twentieth century avant-garde art and theatre, and contemporary pop culture. Williams blends ritualistic references from Shamanism, Voodoo and Modernist primitivism with art historical giants — Picasso, Leger, Klein and Flavin — and a range of pop culture influences including hip hop, Milli Vanilli and A Chorus Line. Developed by Artspace, Sydney and presented at Monash University Museum of Art (MUMA), Melbourne, The Curtain Breathed Deeply debuted on the international stage at Performa 15 in New York. Toured by Museums & Galleries of NSW, The Curtain Breathed Deeply will tour to nine venues across Australia from 2016 to 2018, engaging audiences nationwide with this series of fun and enthralling performative installations. Justene Williams lives and works in Western Sydney and has exhibited widely throughout Australia and internationally. Selected solo exhibitions include: Handbag Hammer Meditation, La Centrale Galerie Powerhouse, Montréal, 2013; Static Ballet, Sarah Cottier Gallery, Sydney, 2013; She came over signing like a drainpipe shaking spoon infused mixers, a public work for Christchurch Art Gallery, 2013; Turnstile Heaped on Pour Down, St Paul St Gallery, AUT Auckland University, 2012; and BIGHEAD GARBAGEFACE GUARDS GHOST DERR SONATA, Contemporary Project Space, Art Gallery of New South Wales, Sydney, 2009.